So Edward pretends to be a seal , a lion, and a snake. But as to be expected, he soon discovers that he should just be himself, and returns to his pen, where a surprise awaits. The rhythmic verse and hilariously expressive illustrations will make this book difficult to read just once. Martina the beautiful cockroach is ready to choose a husband, but first he must pass Abuela's (Grandmother's) coffee test. The full-size illustrations add gentle humour to this Cuban folktale. A sweep is a kind of plow. In some States, when someone died, a relative would hit the plow with a hammer. This was called toning the sweep. It rings the dead person's soul to heaven. Emmie and her mother are helping Grandmama Ola pack up her life. Ola is terminally ill, and she is moving in with Emmie's family. Every box that they pack and sometimes unpack, awaken memories of people and places and moments. A tender story about life and death. Patrice doesn't fit in at her school, where kids tease her about her hair, and aren't interested in learning. When she hears about a scholarship competition for a prestigious African-American boarding school, she knows that she has to apply. There are challenges for Patrice to overcome, which she bravely does, supported by her friend Monty. Sometimes, having one good friend can give you the confidence to stand on your own. Zack's father is Jewish and his mother is African-American. So Zack has a bit of an identity crisis. He's also angry that he was given no choice when his parents decided to move to a new town. Disinterested in school, he's given a chance to salvage his grades with an independent history project. His research into Richard Pierpont, a former African slave, inspires Zack to look for his maternal grandfather. What he discovers about the man reveal the roots of a family mystery and forges a more understanding relationship with his parents. The story begins slowly, with some clunky, over-descriptive sentences, but it improves with each chapter. Zack's growth is mirrored by those of his parents, especially his mother, as she realizes that she must always tell her son the truth. For those who aren't into the Olympics, there's also tennis (and other sports, but tennis is my favourite). The Australian Open tennis tournament is currently underway in Melbourne. Andre Agassi became very well-known Down Under, winning the tournament four times. What surprised me about Open was not Agassi's hair, or his drug use, but his hatred of tennis. However, when you realize that he was forced into tennis from a very young age, forced to confront a frightful ball machine every day, with his father's shouts - Hit harder! Hit earlier! Vork your wolleys! (Work your volleys) - ringing in his ears, you begin to understand. Andre was never given a choice. He was sent away to become a Number One tennis pro, whether he liked it or not. Confused by his rebellious actions, misunderstood by the press, trying to meet other people's expectations, he struggled with depression and anger. It is only when he chose to play, inspired by his realization that he could help others, that he learned to finally enjoy tennis. He was also fortunate in choosing the right friends to support him on his journey. It's a good message for every teen trying to make his or her way. Agassi's story also has its lighter moments. My favourite is the first meeting between Mike Agassi (Andre's father) and Peter Graf (Steffi's father). Everything goes well until Graf dares to tell Andre, This is the shot you should have had. Infuriated, Mike Agassi retorts, Well, this is the shot Stefanie should have had! A battle for one-upmanship ensues and a fistfight is narrowly averted. Hilarious. Get ready for the Olympics! If you've ever wondered what luge or nordic combined was, or were confused by freestyle skiing, check out these lively and fun books about the Winter Olympics. Each title provides a brief overview of each Winter Olympic sport, along with historical facts, interesting trivia, and notable athletes. Perfect to browse through as you watch the games. Buy the entire set (8 in all) at Crabtree Books. Published by National Geographic, and filled with excellent photos, this is an entertaining account of the Winter Olympics: how it began and the challenges involved in running it. There are profiles of exceptional athletes, unexpected medallists, and descriptions of extreme sports. Includes an Olympic Almanac, with statistics and quick reference information. 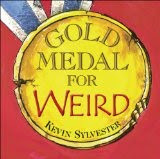 For kids who like strange trivia, try Gold Medal for Weird, a book of Olympic sport moments from both Summer and Winter Olympics. It contains a few heroic and not-so-heroic athletes, wardrobe and equipment malfunctions, interfering spectators, and really unusual sports. Children frightened by the earthquake in Haiti may be reassured by these stories of young people surviving other disasters such as fires, landslides, tsunamis, and hurricanes. All the stories are tragic and often heart-breaking, but the courage and resilience seen throughout provide a measure of inspiration and hope. Each tale ends with a note on the lessons learned and the actions taken to prevent future calamity. This version of Cinderella is unique in that no magic is involved. Adelita wears a dress and rebozo (shawl) that once belonged to her late mother. It is the reboza that tells Javier, Adelita's childhood friend, where to find her. Tomie dePaola's colourful paintings, inspired by Mexican folk art, turns Cinderella into a gentler and happy story. Spanish phrases are found throughout the text, with a pronunciation guide at the end. 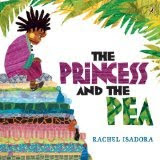 The classic fairy tale with African-inspired artwork. It also teaches readers about different African styles and language. Go on a journey from the sun to the earth, becoming a hurricane, a tornado, and a thunderstorm. Along the way, learn about weather instruments, wind, fog, clouds, frost, deserts, monsoons, and climate. With spectacular photographs and diagrams. Perfect for budding meteorologists. A beginner's introduction to cold weather. Brief chapters discuss the formation of frost and ice crystals, how glaciers shape the earth, and how plants and animals adapt to cold. Easy activities encourage readers to develop skills in experimentation and observation. The final chapter - Ice Age or Heat Wave? - doesn't really provide an answer that will satisfy astute readers. You may need to look for other books in the Science of Weather series, available at your library or at Lerner Books. Wilson Bentley was obsessed with snow. He thought snow crystals were beautiful and wanted to share them with others. He tried drawing snowflakes, but they always melted before he could finish. His career took off after his parents saved up to buy him a special camera. At first, no one was interested in his photographs until colleges and universities started collecting them. 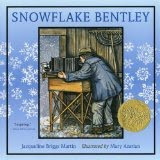 Bentley went on to become an expert on snow, rain, and clouds. An interesting portrait of a self-taught scientist that should inspire readers to look for the extraordinary in nature. The end pages include three of Bentley's remarkable photographs. This is a fictional account of Wilson Bentley's life, as told in the imaginary voice of his brother, Charles Bentley. It manages to capture Wilson Bentley's determination, but the illustrations don't quite capture the snow crystals' beauty. Bentley's collection of snow crystal photographs. There are over 2,000 photographs. All the snow crystals are beautiful and all are different. There are also photos of frost on windowpanes and dew on spider webs & blades of grass. You can also view Bentley's photographs at http://www.bentley.sciencebuff.org/index.htm.